Mutated Tech Brings Laughs, Action to Turtles - ILM mashes up motion-capture and animation in new ways to live up to the mix of comedy and thrills that define Teenage Mutant Ninja Turtles. BoJack Horseman - Netflix gets animated with BoJack Horseman, a comic take on a washedup former sitcom star that is the streaming service's first original toon. Animals and Plants — In Space! Framestore and MPC each faced distinct challenges in animating Guardians of the Galaxy's Rocket and Groot. Heist Style - The Suicide Squad takes center stage in Batman: Assault on Arkham, which mixes the gritty world of the hit video game with a stylish take on the big crime genre. 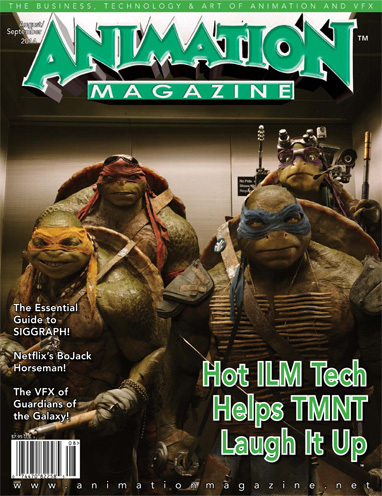 Teenage Mutant Ninja Turtles, Gravity Falls, BoJack Horseman, Guardians of the Galaxy, Batman: Assault on Arkham, SIGGRAPH 2014 and much more!